This post has been sponsored by 5KPlayer. Remember the days when the 720p content awed the viewers with its quality. Well, now we are way past 720p and creators have started creating content with resolutions as high as 8K. While 8K content will still take some time to become a mainstream format, 4K and 5K content are slowly becoming the norm. As now most of the premium laptops come with a higher resolution display, user’s capacity to consume the higher resolution content is also increasing. However, the display is only one of the factors when it comes to consuming 4K or 5K content. You also need a powerful processor and a media player which can easily handle the content. If you have got the hardware part covered, we have a great suggestion for the media player you should use. 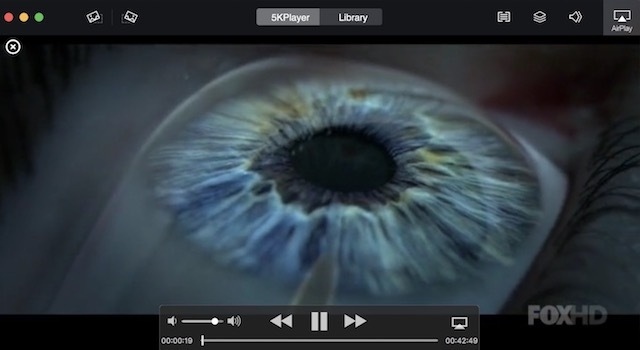 5KPlayer is one of the best media players which can easily handle the content up to 5K. 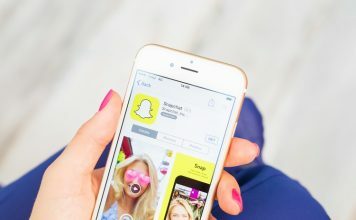 Not only that, it also packs a ton of other features like support for radio and DVD playback, built-in Airplay sender/receiver, and support for various file formats, which will enhance the way we consume the video as well as the audio content on our laptops. The software is available for both Mac and Windows and we are going to take a detailed look at its features and capabilities now. As you can deduce from its name, the media player focuses on its ability to play video content up to 5K with ease. 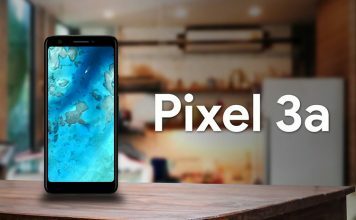 However, you will have to remember that, you will also need a compatible hardware and display, to enjoy the content as it is supposed to. If you got the compatible hardware, the software will allow you to make the most of it. With that point in mind, let us take a look at some of the key features of this software. Well, let us take the most obvious feature out of our way, that is, the support for the 5K media playback content. In my few days of usage, the video player handled all the content I could throw at it. The video playback was smooth and without any stutter. The only time I ever felt a hiccup when playing a 4K or 5K video was when I was using the rewind or the fast forward button. Other than that, the playback was smooth as possible. Needless to stay, you won’t be disappointed with this player when watching 5K content on your laptop or desktop. If you own an iPhone or a Mac, you are going to love this feature. 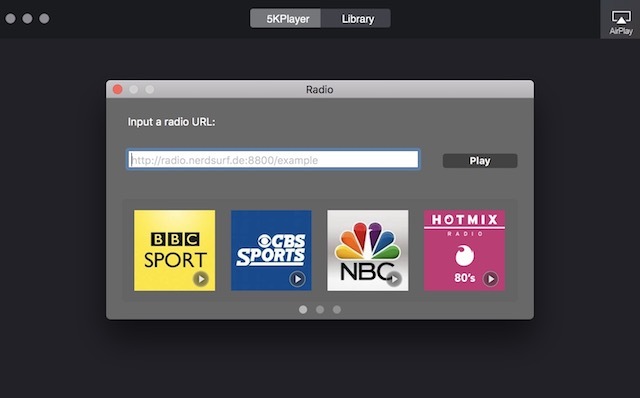 5KPlayer comes with a built-in support for Apple’s AirPlay feature. 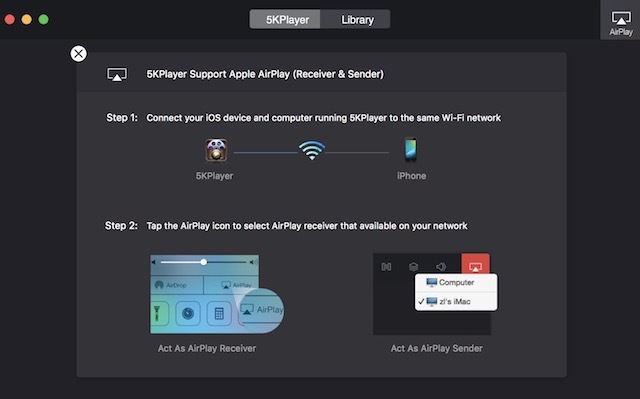 What’s unique here is that not only it can act as an AirPlay Sender but also as a receiver. It can receive streams from an iPhone, iPad or iPod which are running on iOS 10. You can even use your Apple Watch to do the same. When it comes to acting as an AirPlay Sender, the app allows you to send MP4, MOV, M4V, MP3, and AAC files among others to Apple TV 4 and AirPlay enabled speakers wirelessly. 5KPlayer also supports audio files. This means not only can you use this software to watch movies and TV-shows, but, it can also be used for playing your favourite music. 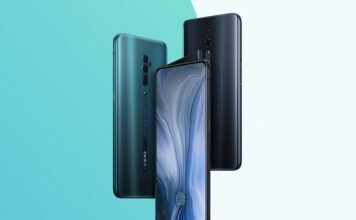 It supports a wide variety of audio files including MP3 music, DTS multi channel surround sound, AAC, AC3, WMA, and FLAC & ALAC lossless audio files. 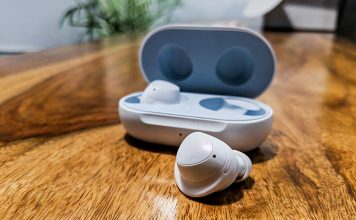 The software claims to make use of its TrueTheater technology to enhance your audio listening experience. However, I am not an audiophile so I cannot comment on that. If you are one, you can use it and decide it for yourself. 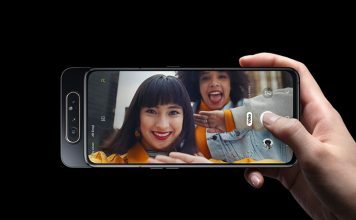 Apart from supporting video and audio playback, the app can also receive satellite radio to help you listen to the radio from right inside the app. You can either choose to listen to some of the radio stations which already come preset with the app, or you can insert your own radio URL and listen to it. Some of the preset radio stations include BBC, NBC, XFM, Kiss, and Chill among others. Apart from these main features, there are also a ton of other features. For example, there’s a library section inside the app, which you can use to manage all your video and audio files. There’s a built-in internet download manager, which can help you download videos from the internet. You can also convert videos from one format to another. As I said, the app brings a ton of cool features which you will enjoy while using it. If you just use the 5KPlayer as a video player (which is its main function), there’s nothing much to discuss in terms of its user interface. The app works and behaves like any other good video player out there. It has all the playback controls and they all work smoothly. However, I do like the toggles for switching audio and subtitle tracks while playing the video. It is a very nifty feature, which most of the major video players keep hidden under layers of settings. 5KPlayer gives you easy access to these features by keeping toggles at the top-right corner of the app. The app keeps a library that maintains all your recently played songs and videos. To access the whole local music library, click “+” icon and choose local files to add. You can also remove any songs or videos from a playlist or remove a playlist altogether using the “-” icon. You can add, create and edit a playlist by clicking “+ New List” icon. To delete the added playlist, put mouse cursor on the playlist and a “X” icon would show up, click it. 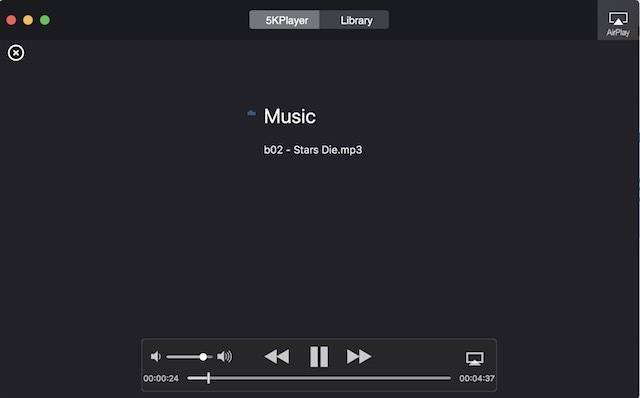 Overall, the music player is pretty basic. But, considering this is just an added functionality, I cannot complain much about it. When it comes to AirPlay, I love how easy it is to access it from the app. There’s always an AirPlay button no matter where you are on the app. You just have to click on it and select the device you want to use for streaming your content. All in all, the app’s interface is pretty easy to navigate and use. There’s nothing which will stumble you here. All the features are kept front and centre. Probably, the only downside is its music player, other than that, the app nails it when it comes to user interface. 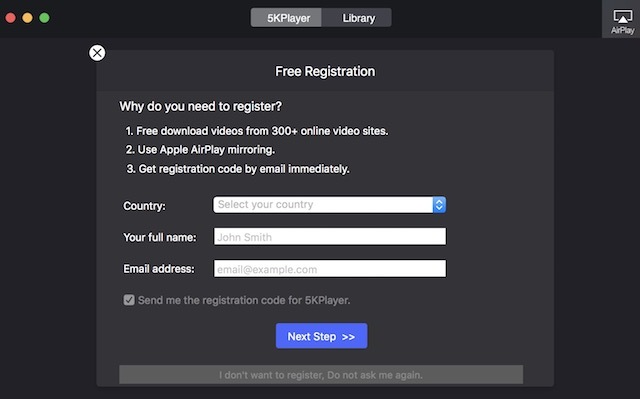 5KPlayer is available for both Mac and Windows and can be downloaded from their website. The best part is that the app is free to use forever. Also, there are no ads here which can hamper your experience. When you launch the app for the first time, the app will ask for a few details such as your country, name, and email-id. When you input the required information the app sends you a registration code, which you can use to unlock the full app and use it for free. 5KPlayer not only does what it promises but also bring a ton of other cool features to the table. 5K playback is smooth as ever and there’s no stutter what so ever. The music and radio player is a very nice addition. It supports most of the audio and video files and also lets you convert videos from one file type to another. Considering its feature set along with its price tag (free), it’s really easy for me to recommend this to anyone. It’s one of those free apps, which, even give the paid ones a run for their money. 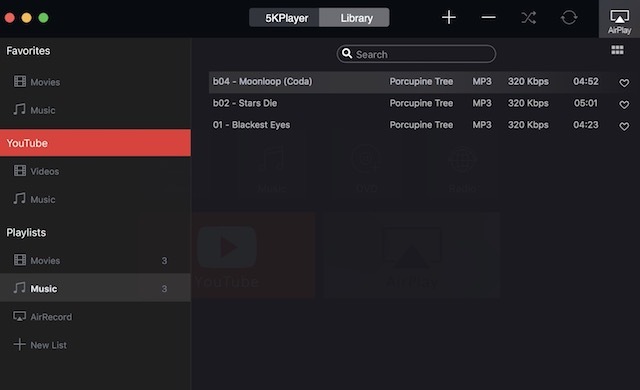 If you are looking for video playing software, you should definitely try 5KPlayer.